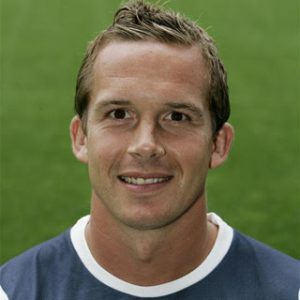 Kevin Davies is an English former professional footballer who played as a striker for Chesterfield, Southampton, Blackburn Rovers, Millwall, Bolton Wanderers and Preston North End. Kevin was known for his bustling, physical playing style; he has committed more fouls than any other player in the history of the Premier League, although conversely he is one of the most fouled so while he could certainly dish it he didnt mind taking it back which is what football should be all about! Kevin originally made his name as a vital part of the Chesterfield team which reached the semi-finals of the FA Cup in 1997. He left Chesterfield at the end of that season, having made 148 appearances for the club and joined Premier League side Southampton in May 1997. He only spent one season at Southampton, making 30 appearances, before he joined Premier League side Blackburn Rovers in a club-record £7.5 million deal. Once again, he spent a single season at the club, making 29 appearances, before rejoining Southampton in 1999. In his second spell at the club, he made 95 appearances, also spending part of 2002 on loan to First Division side Millwall, where he made nine appearances. Released by Southampton at the end of the 2002–03 season, he joined Premier League side Bolton Wanderers on a free transfer. He was made Bolton team captain in January 2009 and went on to make 407 appearances for the club, scoring 84 goals, then played two seasons at Preston North End before retiring. He made three appearances for the England under-21 side between 1997 and 2000. At the age of 33, Davies made his international debut, and only appearance, for England against Montenegro in a 0–0 draw on 12 October 2010, coming on as a second-half substitute.